Moving between local political parties can sometimes be a real culture shock, especially when the party is in a much different head-space than the one you’ve arrived from. For Green Party members right now, moving from Brighton and Hove to anywhere else would always be a real change of pace, especially in light of the recent budget drama by the sea. Whilst much of the national gaze is fixed on our first MP and Council, the early signs are that I can contribute something useful to the work being achieved by our energetic local activists here. It’s a fantastic time to be joining them too – we are in the midst of the upcoming Mayoral and Greater London Authority elections and in Jenny Jones, we have a distinctive and optimistic candidate with a vision to tackle rising inequality, the excesses of an unregulated city and job creation across London. As a result of their personal records and the national position of their parties, each of her opponents are discredited figures unlikely to arouse too much passion amongst the electorate. A genuine opportunity to advance the Green share of the vote is within our grasp if we push outside our comfort zones and become a voice of clarity amongst the bread and butter issues of employment, cheaper public transport and the rising cost of living in the capital. Although I have only been back in the city for a week, I’ve lost no time in throwing myself into meeting some energetic new colleagues from Lambeth GP and hitting the streets with our election message. 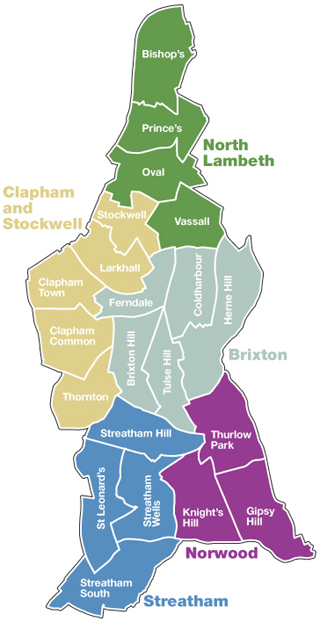 Whilst I lived for 16 years in London before my sojourn to the seaside, I don’t know the area too well once we’re off Clapham High Street, so leafleting last night felt more like local orientation than hard work! This feels like a vibrant area to be living in, but like many other neighbourhoods in London, you can sense that life has become harder in the last couple of years. People are crying out for optimism in public life and concrete solutions to the problems we are facing. The small number of people I spoke to were warmer than I expected to the Greens, which is a positive sign that we might be getting more air-time with the electorate. Over the next few weeks I’ll be getting to know about (and blogging on) the particular challenges facing this community and how we can articulate solutions to them in the campaign work we are doing in the run up to the London elections and beyond. I hope you’ll continue to follow my analysis of how our campaign affects the local and national political weather.